Herb and Gruyère Biscuits – Voila! Whole Foods sells delicious herb and cheese biscuits. Don’t tell them, but I think these are better. They’re flakey, buttery, savory and so good. I served them with chicken noodle soup. However, they would also be great bread for turkey sandwiches. 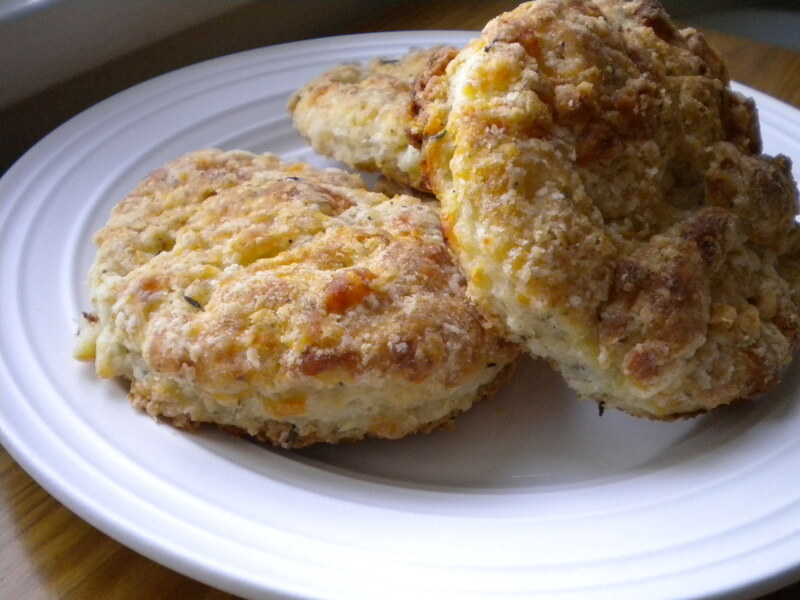 Just as the use of these biscuits are endless, so are the mixture of herbs and cheese you could use. Rosemary and gouda, anyone? Preheat the oven to 425 and line large baking sheet with parchment paper. 1. In a food processor, quickly pulse the flour, baking powder, baking soda and fine salt. 2. Add the chilled butter and process the flour until it is the size of peas. Pour into large bowl. 2. Add the thyme and sage, and the gruyère. Stir in the buttermilk just until the dough is moistened. 3. Lightly dust a work surface with flour. Turn the dough out onto the surface and knead 2 or 3 times, just until it comes together. Pat the dough into a 1/2-inch-thick disk. 4. Using a 3-inch round cookie cutter or rim of a glass, stamp out biscuit rounds as closely together as possible. Gather the scraps and knead them together 2 or 3 times, then flatten the dough and stamp out more biscuit rounds. Pat the remaining scraps together and gently press them into a biscuit. 5. Transfer the biscuits to baking sheet and brush the tops with the melted butter. 6. Bake the biscuits for 20 minutes, or until golden. Let the biscuits cool slightly on the baking sheet before serving. Oh, these look delicious! Great recipe! I love variations on biscuits. These look delectable. Thanks for posting the recipe! of course! hopefully you enjoy them as much as we did! I made these biscuits the night before last to accompany a Beef and Barley Soup, and you were right, they were great! I posted a pic of them on my blog. I didn’t post the recipe, but rather included a link to this post. Thanks for sharing this recipe! Pingback: Chocolate Cheesecake with Dark Chocolate Kahlua Ganache « Voila!